1 photograph; b & w; 4.75 x 3.25 in. 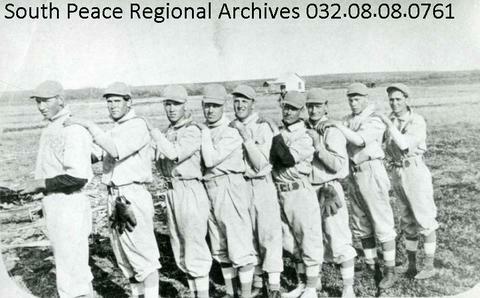 The Deep Creek baseball team in 1913, part of the Twilight League. Left to right: Neil Vance, Rupert Carveth, Lyman Johnston, Cecil Johnston, Boody Sprague, Wylie Sawyer, Eric Anderson, Rae Hegler, and Wes Bentley.